Doughnut maker Krispy Kreme has seen its profits slim as more US consumers turn towards low-carb diets. The firm said doughnut sales were falling across the industry, and it would delay opening 40 new stores, with just 80, rather than 120, more in 2004. The first quarter loss of $24.4m(£13.45m) pushed shares down to $19.85, compared to a 52-week high of $49.74. More and more Americans have tried to cut out carbohydrates as part of the popularity of the Atkins diet. For the diet's adherents, Krispy Kreme's products - as well as baked goods in general - are off the menu. The losses mark the first real setback for the company since it went public four years ago. In the intervening time it has expanded overseas, including an outlet in the upmarket Harrod's department store in London. The brand's endorsement by celebrities has helped drive it to a strong position in the 10-billion-doughnut-a-year US market. And since floating in 2000, its shares have tripled in price. As a result of the losses, the company says it will scale back its plans to open 120 new stores this year to just 80. It has grown at breakneck speed since flotation, and currently has 401 stores throughout the US. It will also shut down Montana Mills, the gourmet bakery business bought last year for $40m. Excluding those closure costs, the firm had an operating profit of $14.3m, up slightly from the same period last year. But the 0.4% fall in overall sales in the most recent quarter - compared with a 7.4% annual rise in the previous three months - may indicate trouble ahead. The company says that in the future, sales will grow by 20% to 25% for the full year, but stripping out the effects of expansion, overall sales growth will be in the low to mid-single digit percentage. 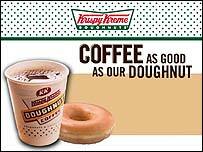 In an earlier statement, Krispy Kreme had no hesitation in blaming the Atkins diet and its look-alikes for its woes. "For several months, there has been increasing consumer interest in low-carbohydrate diets," said Scott Livengood, the firm's president, chief executive and chairman. "This trend had little discernible effect on our business last year. But recent market data suggests consumer interest (in low-carb diets) has heightened significantly following the beginning of the year and has accelerated in the last two to three months." In a sign of how seriously it takes the problem, Krispy Kreme is also hoping to bring out a low-calorie, sugar-free, doughnut by the end of this year.